The design study previews the brand’s plan to launch a range of high-performance electrified vehicles which promise an engaging drive and deliver range confidence. The INFINITI line-up of the future will consist of a range of electric, e-POWER and performance hybrid vehicles. The QX Inspiration signals a new era for INFINITI design enabled by technology, with a form language hinting at the potency and character of electrified powertrains. The new concept sets a direct precedent for the company’s first fully-electric production car, illustrating how new architectures and technologies are influencing modern INFINITI design. It also draws on the Japanese spatial concept of ‘Ma’, demonstrating how open spaces between lines create tension and builds anticipation. 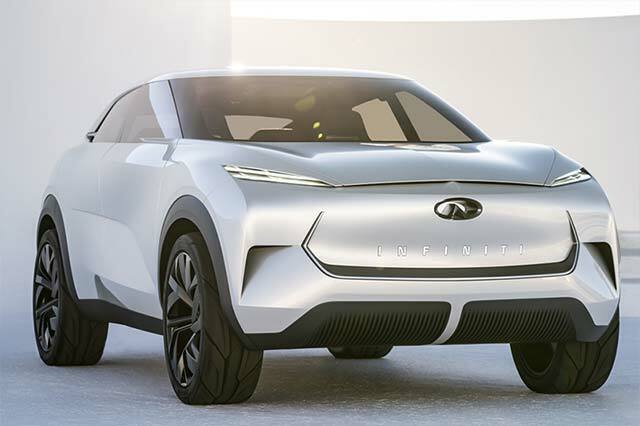 The QX Inspiration concept sets a direct precedent for the brand’s first fully-electric car: a high-performance SUV offering total range confidence. Electrification is a natural next step for the company, and, as a member of the Renault-Nissan-Mitsubishi Alliance – the industry leader in low- and zero-emission vehicles – a range of ultra-low emissions technology is available to INFINITI. INFINITI’s future models will offer drivers a mixture of fully-electric, e-POWER and performance hybrid vehicles. These powertrains will be matched with dedicated platforms and vehicle architectures, delivering the high performance, complete range confidence and low environmental impact that buyers are coming to expect from premium car manufacturers.